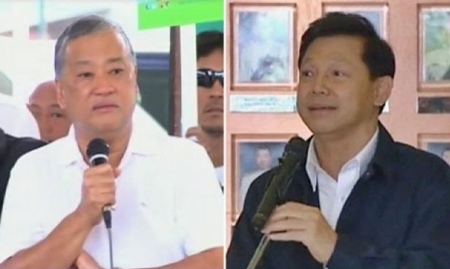 BANGKOK, Jan 23 – An academic poll released today showed Democrat candidate Sukhumbhand Paribatra leading slightly and his rival Pongsapat Pongcharoen from the government bloc running almost neck and neck in their campaigns to win the March 3 Bangkok gubernatorial election. Referring to its interviews with 1,500 respondents above age 18 in all 50 districts of the Thai capital late last week, the National Institute for Development Administration (NIDA) said 20.60 per cent of residents will vote for ex-Bangkok governor Sukhumbhand while 19.13 per cent opted for national police former deputy chief Pongsapat. Other candidates were trailing, and received much less attention. Former national police chief Seripisut Temiyavet led the also-rans with 4.93 per cent, Suharit Siamwalla had 1.13 per cent, and Kosit Suvinitchit came last with 0.27 per cent. However, the NIDA poll indicated that more than half of the voters — 52.80 per cent — remain undecided and 1.13 per cent say they will refuse to go to the polls at all. Bancherd Singkaneti, dean of the NIDA Faculty of Law, said the poll results reflected the two rivals’ close relations with their respective political strongholds, while the independent candidates look to be at a strong disadvantage as the lack significant political bases. Prof Banchert said the percentage of undecided voters is rather high probably because they are awaiting clearer policy statements from the candidates. Eighteen candidates have officially applied to run for the Bangkok governorship.